The FCT Minister, Malam Muhammad Musa Bello has expressed delight with the pace of work at the ongoing Nnamdi Azikiwe International Airport road reconstruction project. 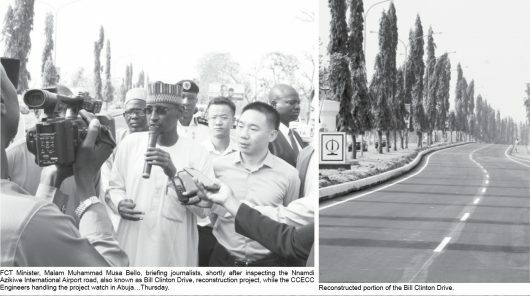 Bello was pleased that work on such a major arterial road, also known as Bill Clinton Drive, linking the Airport to Umar Musa Yar’Adua Express Road was being undertaking with minimal damage to vegetation and utilities, improvement on services, on schedule and without any major hindrance to traffic. He said: “our major concern had been how we were going to execute such a major infrastructure work without posing a major obstruction to traffic as well as preserving the trees and street lights. According to him, the Administration was proactive in taking up the reconstruction project as it was evident that the road was beginning to show signs of deterioration, it therefore had to act quickly to stem a possible collapse. He further explained that the pattern used in the ongoing Bill Clinton Drive reconstruction project, which included advocacies and stakeholder consultations, would set the standard for future reconstruction works in the city. The Minister, who was led on the inspection visit by the Executive Secretary, Federal Capital Development Authority – FCDA, Engr. Umar Gambo Jibrin, noted that the project is a reflection of the commitment of the President Muhammadu Buhari’s belief that infrastructure is the bedrock of any national development. He commended the team of engineers from FCDA as well as the China Civil Engineering Construction Corporation, (CCECC), for the excellent work they were doing. He urged them to ensure adequate laybacks and to make provisions for bus-stops to service the adjoining residential areas. Earlier, Director of Engineering Services FCDA, Engr. Hadi Ahmad said that work on the 7km road involved scarification, stabilization of earth work and “Dunlop” asphalts. Ahmad disclosed that the team has been able to effectively manage the diversion of both inbound and outbound traffic in a seamless manner. He opined that the outlook of the road has been improved with better kerbs, wider road shoulders and adequate drainage system. He expressed hope that the completed side of the road would be opened to traffic by next week while work would move to the other side of the drive way. It could be recalled that the Federal Executive Council last year approved the sum of N1.7 Billion for the reconstruction of the Bill Clinton Drive in order to stem the possible collapse of the road which as at then had far outlived its life span.